Raymond Fritz Frizell died January 27th, 2019 in Napa, California after complications from a quadruple bypass. He was 81 years old. His life was epic in its challenges. He loved Elvis, orchids, words, sentences, chocolate and ultimately his wife of 57 years. Mr. Frizell was a thinker and he attempted to treat everyone he met with his kind stewardship. He would observe everyone and everything. He loved direct sunlight on his skin and quiet contemplation. Born in Sondheimer Louisiana, January 7th, 1938, Mr. Frizell was a lifelong Hotelier having handled all aspects of upper management and accounting at large, small and boutique hotels throughout New Orleans and San Francisco. His hotel career began in the early1960’s and continued through the mid 90’s where he finished held his last position at San Francisco’s Sir Francisco Drake Hotel. Mr Frizell also held management positions at New Orleans Magazine in the late 70’s before relocating to Madras, Oregon to assume operation of an Indian resort, an unusual move at the time for an American family. With an early interest in pre-med, Mr. Frizell would depart Louisiana Polytechnic before attaining his degree in order to care for his mother, Golda Frizell. Ray and Kay Frizell, his wife of 56 years, met in Natchez, Mississippi in 1962 at the Belmont hotel but would defiantly relocate to San Francisco in the 1970’s. Mr. Frizell led a literary life but never published a word in his lifetime. Over the course of his career, Mr. Frizell met noted authors such as Tennessee Williams, Norman Mailer, as well as luminaries Clint Eastwood and Elizabeth Taylor, among others. 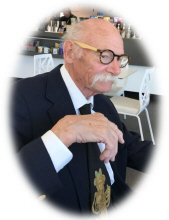 Warm, kind and tolerant with a handsome face and his trademark ‘Mark Twain’ mustache, Mr. Frizell was intelligent, well-spoken, and always in possession of a sartorial flair. Always interested in ideas, Mr. Frizell was a survivor in life and was tested exhaustively, but always felt the presence of God. “I want to see what it's all about” he once uttered, referring to the mysteries of life. Now he knows. He is survived by his wife Kay Frizell, (77), his wife of 57 years of Natchez, Mississippi, their oldest son Raymond Kyle Frizell, (57) their middle son Guy Michael Frizell (50) and their daughter Mitzi Kay Frizell (48). For the family, the loss is immeasurable. Raymond Fritz Frizell lives in the hearts of his surviving family to whom he dedicated his life. To send flowers or a remembrance gift to the family of Raymond Fritz Frizell, please visit our Tribute Store. "Email Address" would like to share the life celebration of Raymond Fritz Frizell. Click on the "link" to go to share a favorite memory or leave a condolence message for the family.